This was really good...I too had my eye brow raised when there was no garlic in recipe. 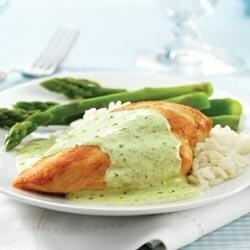 Make sure you season the chicken or else you'll end up with a tasty sauce with bland chicken. I added 2 tbsp of white wine to deglaze skillet. I also recommend doubling cream cheese and chicken broth if you want extra sauce for pasta, rice, etc.